Heart of Atlanta Motel, Incorporated v. United States, et al. Congress did not unconstitutionally exceed its powers under the Commerce Clause by enacting Title II of the 1964 Civil Rights Act, which prohibited racial discrimination in public accommodations. Northern District of Georgia affirmed. Heart of Atlanta Motel Inc. v. United States, 379 U.S. 241 (1964),  was a landmark United States Supreme Court case holding that the U.S. Congress could use the power granted to it by the Constitution's Commerce Clause to force private businesses to abide by the Civil Rights Act of 1964. This important case represented an immediate challenge to the Civil Rights Act of 1964, the landmark piece of civil rights legislation which represented the first comprehensive act by Congress on civil rights and race relations since the Civil Rights Act of 1875. For much of the 100 years preceding 1964, race relations in the United States had been dominated by segregation, a system of racial separation which, while in name provided for "separate but equal" treatment of both white and black Americans, in truth perpetuated inferior accommodation, services, and treatment for black Americans. During the mid-20th century, partly as a result of cases such as Powell v. Alabama, 287 U.S. 45 (1932); Smith v. Allwright, 321 U.S. 649 (1944); Shelley v. Kraemer, 334 U.S. 1 (1948); Sweatt v. Painter, 339 U.S. 629 (1950); McLaurin v. Oklahoma State Regents, 339 U.S. 637 (1950); NAACP v. Alabama, 357 U.S. 449 (1958); Boynton v. Virginia, 364 U.S. 454 (1960); and, most notably, Brown v. Board of Education of Topeka, 347 U.S. 483 (1954), public opinion began to turn against segregation. Despite the outcomes of these cases, segregation remained in full effect into the 1960s in parts of the southern United States, where the Heart of Atlanta Motel was located. The Heart of Atlanta Motel was a large, 216-room motel in Atlanta, Georgia. In direct violation of the terms of the Civil Rights Act of 1964—an act which banned racial discrimination in public places, largely based on Congress' control of interstate commerce—the motel refused to rent rooms to black patrons. The owner, Moreton Rolleston, filed suit in federal court, arguing that the requirements of the act exceeded the authority granted to Congress over interstate commerce. In addition, Rolleston maintained that the act violated his Fifth Amendment rights to choose customers and operate his business as he wished and resulted in unjust deprivation of his property without due process of law and just compensation. Finally, he contended that Congress had placed him in a position of involuntary servitude by forcing him to rent available rooms to blacks, thereby violating his Thirteenth Amendment rights. In response, the United States countered that the restrictions requiring adequate accommodation for black Americans were unquestionably related to interstate travel, and that Congress, under the Constitution's Commerce Clause, certainly had the power to address such a matter in law. It further argued that the Fifth Amendment does not forbid reasonable regulation of interstate commerce, and that such incidental damage did not constitute the "taking" of property without just compensation or due process of law. Lastly, it asserted that the Thirteenth Amendment applies primarily to slavery and the removal of widespread disabilities associated with it; as such, the amendment undoubtedly would not place issues of racial discrimination in public accommodations beyond the reach of federal and state law. The United States District Court for the Northern District of Georgia ruled in favor of the United States and issued a permanent injunction requiring the Heart of Atlanta Motel, Inc. to refrain from using racial discrimination when providing services or goods to guests or the general public on its premises. This case was combined with the case of the future Governor of Georgia Lester Maddox concerning his Pickrick restaurant and his case to refuse to serve blacks. The opinion of the court, announced on December 14, 1964, was delivered by Justice Tom C. Clark, with concurring opinions by Justice Arthur Goldberg, Justice Hugo Black, and Justice William O. Douglas. 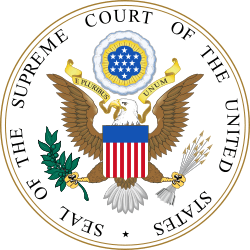 The U.S. Supreme Court held that Congress acted well within its authority under the Commerce Clause in passing the Civil Rights Act of 1964, thereby upholding the act's Title II in question. While it might have been possible for Congress to pursue other methods for abolishing racial discrimination, the way in which Congress did so, according to the Court, was perfectly valid. It found no merit in the arguments pursuant to the Thirteenth Amendment, finding it difficult to conceive that such an amendment might be applicable in restraining civil rights legislation. Having observed that 75% of the Heart of Atlanta Motel's clientele came from out-of-state, and that it was strategically located near Interstates 75 and 85 as well as two major Georgia highways, the Court found that the business clearly affected interstate commerce. Accordingly, it upheld the permanent injunction issued by the district court and required the Heart of Atlanta Motel to receive business from clientele of all ethnicities.